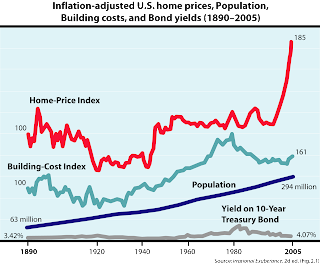 There's a lot to be gleaned from this chart, but setting aside the recent bubble what strikes me most is the overall rise of home prices after 1920, defying the 20th century trend for nearly all other built or manufactured goods -- which, almost invariably, decreased in inflation-adjusted cost over time with rapid advances in production technology. Although modern mortgage lending was in its infancy in 1920, over 45 percent of Americans owned homes at the time. Sixty percent of owner-occupied homes were owned free and clear, while the mortgages on the remainder typically covered no more than 50 percent of the home's value, and generally matured within three to five years. By contrast, only 33 percent of owner-occupied homes were owned free and clear as of the 2000 Census, indicating that mortgage-free ownership among owner-occupied homes has actually declined in absolute percentage terms since 1920, in spite of a large increase in overall homeownership. All this raises several questions. Did the emergence of widespread mortgage lending and indebted ownership contribute to price inflation of homes after 1920 that was not warranted by their construction cost or the change in the price of land? And if the net growth in ownership during the 1920s accrued to those closest in income to existing homeowners, rather than poorer Americans, what was the effect of this growth on housing affordability for renters and ownership-aspiring, but low-income, persons? 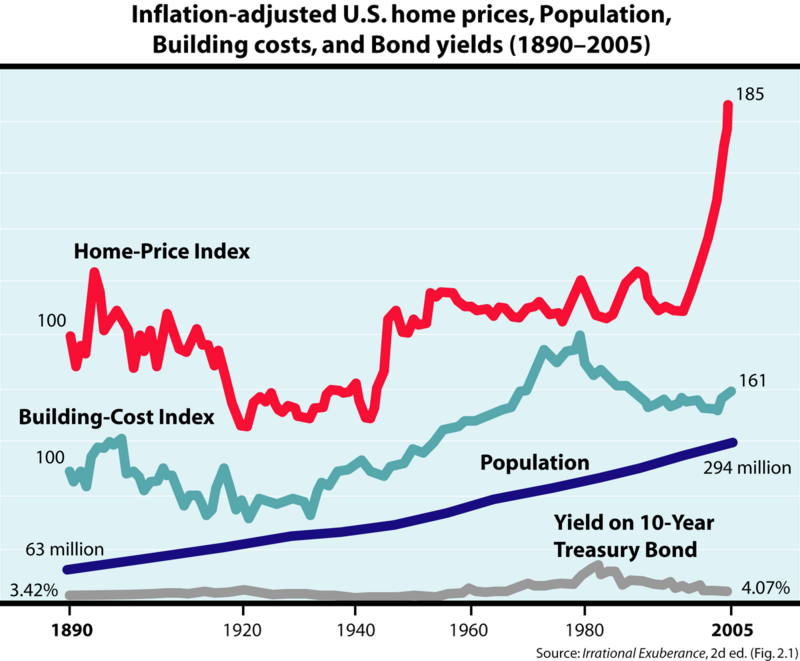 During the period 1950-2000, at least, expansion in overall rates of homeownership was paralleled by an increase in rental costs that far outpaced the rate of inflation. And finally, why did labor-saving innovations in home construction, and an increase in the supply of buildable land enabled by the interstate highway network, not decrease the cost for housing in the 1920-1970 period, as distinct from nearly all other available goods? I don't really have clear answers to these questions, but it could be a starting point for a discussion. The role of zoning and municipal building codes here, which some commenters addressed earlier, I'll save for a following post. House size, more plumbing to support that bath and a half, more electrical circuits and things like central HVAC, would be factors. The older homes (say 1920 to 1940) had maybe one electrical circuit per room, one bath, two bedrooms and you could pack more in a plot. Maybe property covenants requiring specific size, construction etc? By contrast, only 33 percent of homes were owned free and clear as of the 2000 Census, indicating that mortgage-free ownership among owner-occupied homes has actually declined in absolute percentage terms since 1920, in spite of a large increase in overall homeownership. But mortgage-free ownership has increased overall. In 1920: .45X.6 X100= 27% of mortgage-free ownership among all homes, compared to 33% today. 1920: 41% of housing units owner occupied, of which 60% were owned free and clear = 25%. 2000: 68.1% of housing units owner occupied, of which 33% were owned free and clear = 22%.